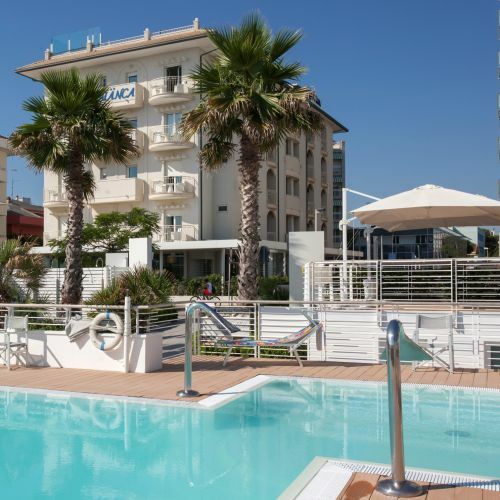 A corner of paradise in the garden of your hotel in Riccione! Within our hotel’s sun deck, you will find a 60 m2 pool equipped with sun loungers, beach umbrellas and a Jacuzzi, both of which are heated to 30°C. This, coupled with the excellent exposure that this area enjoys, making it sunny all day long, means you can swim from the beginning of April until late September! The pool is 120 cm deep, and can be accessed through a steel ladder or the convenient steps. You will find our brand new terrace bar right next to the pool, where you can relax while enjoying fresh fruit cocktails, shakes, ice cream, crushed ice drinks and much more! Or you can also enjoy your refreshing drink on the new raised terrace that overlooks the seaside and features a Wenge wood floor. Breakfast is served every morning in this charming area of our garden, and on Friday nights you can take part in themed dinners and galas organised by Hotel Cà Bianca, with a buffet of finger food, desserts and more.